Manchu bows have a long and vivid history that developed first for hunting, then for warfare. The bow-making process includes over 200 steps and at least a month to create just one bow. Bows today are seen more as novelties rather than useful tools for survival or warfare. The Manchu people of northeastern China have been making bows and arrows from water buffalo horns for thousands of years. 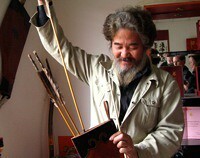 Yang Fu Xi's family has been making Manchu bows and arrows for ten generations, and he now runs a successful workshop and store in Beijing.